The Alternate Broadcast Inspection Program is great but it only addresses the basic FCC complience items in the FCC Self Inspection Check List. For you station to be healthy and reliable technically there are many more items that need to be in place and working properly. Ramsey Communications can perform a due dilligence inspection that looks such things as facility safety and security, system reliability and redundancy, preventative maintenance program, etc. 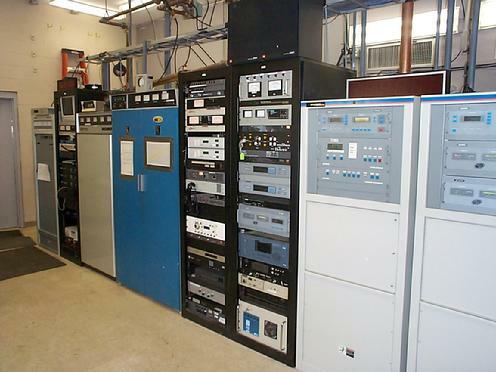 Brand new WCCC AM/FM transmitter site, 2001. Your Station's Audio (both on air and on line). The F.C.C. has been active in a number of areas recently. Indecency is one area that is best left to the programming consultants and attorneys to discuss. However, there are additional areas that should be the concern of every licensee and engineer. This month we will discuss some of the areas that FCC inspectors usually concentrate on during field inspections. PUBLIC FILE: An incomplete Public File is one of the first things an Inspector will discover, and is one of the easiest violations to prevent since station management has 100% control over the contents of the file. At least twice a year, station management should go through the Public File using the FCC Self Inspection Checklist which gives an inventory of the items that must be in the file. POWER/MODE: Inspectors often monitor a station prior to their visit. This allows them to determine if the station is making power and/or pattern changes as the proper time. Since incorrect operation of this type is easy to detect and can cause interference it is critically important that station management ensure that the station operates in the proper manner at all times. EAS: The FCC takes EAS very seriously and so should station management. Weekly tests and activation received from Primary stations must be logged and outgoing tests and activations must be logged as well. These logs must be kept for two years and notations must be made in the log whenever a test or message is missed. TOWER MARKING AND LIGHTING: Since this is a life safety issue, it is imperative that stations follow the rules to the letter. Tower stripes, when required, should be clearly visible from all angles and all tower lights should be in working order. Observations of tower light operation must be made at least once every 24 hours. Any tower light outage must be reported to the nearest FAA Flight Service Station within 30 minutes. RADIO FREQUENCY RADIATION: This is an area that the FCC is getting very serious about. Occupational and public exposure to RF fields in excess of the government limits is not allowed, and areas where this type of exposure is possible must be marked with appropriate signs and made inaccessible.These are just a few of the items that the FCC will check when they inspect your station. Many state broadcaster associations have Alternative Inspection Programs that can be very helpful in identifying problem areas. Ramsey Communications Services is also able to provide mock FCC inspections. FM STATION INTERFERENCE TO CELLULAR LICENSEES: This is becoming more and more of a problem and Ramsey Communications has the expertise to help you determine if there really is a problem and if there is help you resolve it, ideally before the FCC gets involved.